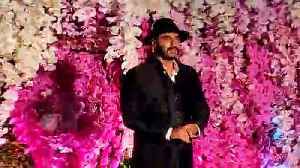 One News Page Australia > News Videos > Did Arjun’s GF Malaika Embarrass Sonam at a Party? With Bollywood actors Arjun Kapoor and Malaika Arora's relationship getting more visible by the day courtesy paparazzi and social media, speculation about cold vibes that Malaika reportedly shares with Arjun's cousin Sonam Kapoor Ahuja have resurfaced. They were also seen together at the pre-wedding celebrations of Akash Ambani and Shloka Mehta in Switzerland last month. Kareena Kapoor Khan, Malaika's close friend, Karan asked her if she would like to say anything about Malaika's wedding. 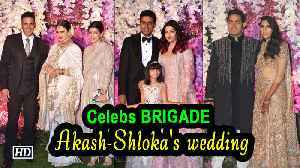 Akash Ambani Shloka Mehta's MUMBAI Reception Party: Lovebirds Arjun Kapoor, Malaika Arora strange behavior, arrive separately at the wedding reception of Akash Ambani and Shloka Mehta. #SonamKapoor who was once miffed with #MalaikaArora was seen posing with her in one of the recent pictures. Watch the video to know more about the same. Check out #MalaikaArora and #ArjunKapoor pose for a romantic picture in Switzerland at #AkashAmbani and Shloka Mehta Pre Wedding party. Get ready for Celebration as Industrialist Mukesh Ambani and Nita Ambani’s Son Akash Ambani is tying the knot with his childhood friend Shloka Mehta in March. Yesterday, one of the hottest and most..